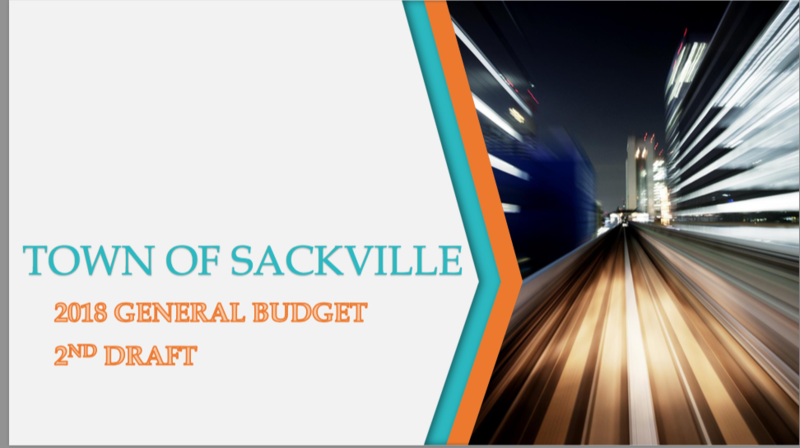 During a special budget meeting Wednesday night, Sackville councillors directed town staff to prepare a 2018 budget with property tax increases that would affect both homeowners and businesses. If, as seems certain, council approves the increases on December 11, the residential property tax rate would rise one cent to $1.56 per $100 of assessment. Treasurer Michael Beal said that would cost someone with a home assessed at $100,000, an extra $10 next year. The basic commercial rate would rise 1.5 cents to $4.545 per $100 of assessment and add an extra $15 on next year’s tax bill for a business assessed at $100,000. All seven councillors present at last night’s meeting endorsed the tax hike after hearing that the province had chopped Sackville’s overall property tax base by $9.2 million to compensate for problems caused by the new digital property assessment system. CAO Phil Handrahan said the town already knew it would lose revenue as a result of hundreds of successful assessment appeals this year, but did not expect a further $7 million reduction in assessment to compensate for the previous year. Beal said it’s the first time in his 24 years with the town that he’s seen a reduction in its provincially set tax base, in this case from over $629 million this year to just under $620 million in 2018. Councillor Bill Evans said he understood that the province was freezing assessments next year and that all municipalities would be facing revenue losses. “[But] a nine million dollar cut in our tax base is not at all what we expected,” he added. “There is only, I think, one other community which took a cut more than ours and that was Moncton, which is more than 10 times bigger than we are,” Evans said. Handrahan said that when Service New Brunswick informed the town about the $9.2 million cut in the tax base, town staff were forced to rejig the first draft of the budget released on November 20. Treasurer Beal took council through a list of reductions from the first draft to the second that, he said, would not affect services. They included a $10,000 reduction in the projected budget for ice maintenance and skate sharpening at the Civic Arena; $7,000 less than projected for street trees and ballfields and the elimination of $6,000 for an external Heritage Officer. To read the list of reductions from the first budget draft to the second, click here. All in all, Beal said he was able to shave nearly $120,000 from the budget leaving a shortfall of almost $62,000. He presented town council with five choices: (1) increase residential property taxes by one cent per $100 of assessed value and 1.5 cents for businesses; (2) cut $62,000 in town services; (3) take the money from the town’s operating reserves of $97,888; (4) reduce the capital fund which pays for such things as roads and sidewalks or, (5) borrow $62,000. Mayor Higham, who doesn’t vote except to break a tie, said he would favour taking $10,000 out of operating reserves and $50,000 out of the capital fund. Although Councillors Aiken, Phinney and Black called for a review of town services, no one at Wednesday’s meeting wanted to cut any of them now or chop capital funding. Several expressed concern about taking money from operating reserves when it might be needed for unexpected expenditures such as the snow removal costs that came in $100,000 over budget three years ago; and no one favoured borrowing the money. After hearing from Beal that Sackville taxes have not gone up for three years, Councillor Joyce O’Neill said she would favour the small tax increase. “I know raising taxes isn’t popular,” said Councillor Megan Mitton adding that if people are paying ten, twenty or thirty dollars more per year, then it spreads the costs out. “That’s what the purpose of taxes is,” Mitton said. “I like taxes,” she added. “Is that political suicide?” she asked with a laugh. This entry was posted in Town of Sackville and tagged 2018 town budget, Bill Evans, Michael Beal, Phil Handrahan. Bookmark the permalink. Perhaps if our esteemed Town Council caused less money to be spent on lawyers, there would be no need for a tax increase. Indeed, perhaps we could be looking at a tax *decrease*. Now, assuming that evaluations go back up, does anyone think that they’ll decrease the rate? I find it very interesting that without affecting services the municipality was able to reduce the budget in the second draft by $120,000. Maybe the second draft should have been the first draft. I’m disappointed that Council did not follow the lead of the mayor and choose a different option as opposed to raising taxes. It will be interesting to see if Aiken, Phinney and Black actually follow through to have a service review completed. Nice to see that councillor Mitton thinks taxes are a laughing matter and raising them a joke. Disappointing. Also I think councillor O’Neil misunderstands folks when they tell her the town is spending too much money. The town spends too much money on fluff (corporate projects) is a line item to ad to the budget it really serves no purpose and the best comment Bill Evans can come up with is the town’s been shafted. Now that’s what I’m looking for in the leadership at town hall. What would $62,000 in reduced services have amounted to? Who would have been affected? We will never know because Council took the easy way out and did not challenge staff to do better. On my last term on Council, I tried to push forward better processes for budgeting one being that a full service review be done every 4 years with the changing of the guard (council). This suggestions were all shunned by council. The province has sent a message to the town of Sackville. Get your spending in line or raise your tax rate you are a have Community compared to others in this province, deal with it. I appealed my tax assessment this year and the province actually reduced my assessment lower then it was 3 years ago. Time for the municipality to wake up and understand the situation we are in. Once again, I find myself agreeing with you Marika, because you simply make sense (minus the sarcasm :)). Seriously, as tax payers, we have the right to know how much our Town Council has spent in legal fees. According to me, another way of learning some simple yet wise ways to save money may be by reading Percy Best’s comment about the earlier article. This being said, increasing property taxes seems unfair, especially to some citizens who cannot afford any slight increase or to our entrepreneurs who do not need another business barrier. Perhaps Mayor Higham’s suggestion is a better alternative then because it does not involve increasing taxes or cutting important services? Who knows? I read somewhere that some small towns in the Maine, USA, have managed not to establish tax properties in the first place or to find alternatives to them (although not all are good ideas). Without being an expert of taxation, surely not in the American system, I wonder if we can try to learn something from these small towns. To conclude, Councillor Mitton asked if taxes are a political suicide? Although this was maybe meant as a funny comment (it is in a sense :), I personally do not think it is the choice of increasing or decreasing taxes that would be a political suicide. Clearly, in life as in politics, we cannot keep everyone happy at once when tough choices need to be made. However, I do think that distrust (with or without taxes), stemming from perceived disconnection between decision makers and citizens, is what could lead to political suicide, to use the same words. I have always thought that Sussex was very similar to Sackville in oh so many ways. Lets just compare the two. The 2016 Census says that Sackville has a population of 5331, while Sussex’s population is 5298. Sackville, for 2018, has an Assessment Tax Base of 619,997,885, while Sussex’s is only 405,019,249. Sackville’s proposed Base Tax Rate for 2018 is 1.56% while Sussex’s is 1.25%. How is it that Sussex manages to run its town seemingly so well with a budget that is vastly lower than that of Sackville? I’m a bit surprised Percy that your figures comparing Sussex and Sackville are incomplete since you were at Wednesday’s council meeting where the Treasurer pointed out that Sussex receives $537,297 in equalization payments from the province while Sackville receives $66,007 plus a one-time financial assistance payment in 2018 of $51,854 for a total of $117,861. So in 2018, Sussex is receiving $419,436 more from the province than Sackville is getting — money that would help subsidize its lower tax rate of $1.26 per $100 of assessment. That’s not the end of the story, however. You would need to compare the level of services in both communities before concluding that Sussex manages to run its town so well with a vastly lower budget. Maybe, maybe not. You have not provided enough information to prove that case. Let’s not forget that Sussex was hit hard when the mine closed… Over 400 people lost their jobs overnight :(. Perhaps this is why they got this (well-needed and -deserved) help from the Government? Hi Bruce, Thanks for such an informative article and for all the research that you put into it. Yes I was at the meeting but as you know the 2 citizens that attended were not privileged to any written paperwork, like the Councilors were, that could actually be taken home. I tried to take a picture of the figures on the TV screen with my cellphone camera but for some reason all i can get is a blank picture. Next time I will take a regular camera. According to my calculations when you include the additional grant figures, as noted above, then one ends up with all of these (income) items totaling $9,855,835 for Sackville and $5,640,539 for Sussex. Amounts per resident would then give our Town of Sackville $1,849 to spend, while Sussex would have only $1,065 per citizen. I, as always, am just hoping that our Town starts concentrating more on Economic Development so that assessments will not continue to dip, as our population seemingly continues to decrease, and that non necessities will take more of a back seat when Council considers them. I really don’t understand how a future million dollar park (Town’s figures), under the guise of a water retention pond at the Quarry, is seemingly taking a $200,000 bite out of our next year’s budget just to get it underway. Could this NOT be postponed. If indeed it is a water retention pond then it probably should have gone in as part of the Lorne Street Phase II Flood Water Mitigation Project and then received 75% Provincial/Federal funding. After all the Town, for some reason, continues to say the major cause of the flooding on Lorne Street is because of the water coming out of the Quarry. Maybe a simple manually controlled gate structure would suffice for now and possibly be built for MUCH less. One also wonders where the additional $300,000 asked for and approved by Town Council about six months ago for Lorne St Phase II will come from. It would seem that this is in addition to the $2.9 million. The Mayor has noted that the project is actually $3.2 million. If 100% of this extra funding is coming from the Town coffers then our direct share of the project increases from $725,000 to now in excess of $1,000,000. — plus of course the future Quarry ‘Retention Pond’. Just hoping for open dialogue from the Town so that the citizens will be well informed. Town councils intention to support a tax increase based on current provincial property assessments shows a lack of empathy for property owners. The Provincial government has put a freeze on assessment increases admitting it has over-assessed the value of property in New Brunswick. Sackville has the highest concentration of assessment errors per person in the province with many local property owners unfairly paying more than they would under a fair assessment regime. The over-assessment problem is ongoing, hundreds of property owners in Sackville are still over-taxed based on inflated assessments and have not had the opportunity to appeal their assessment and in some cases are only now becoming aware of the situation. A tax increase now will disproportionately burden these property owners even further. A tax increase of only $10 a year per $100,000 of assessment is not so insignificant if you are already overpaying hundreds and in some cases thousands of dollars in property tax. I am not opposed to fair and necessary tax increases, but an increase based on current assessments can in no way be deemed fair. To avoid further punishing the victims of the Provincial over-assessment fiasco the Town of Sackville should abstain from increasing property taxes until the Province fully rectifies the assessment problem and a fair and just tax increase can be implemented. The Arts Wall costed Sackville $41,000 (part of it payed by a provincial grant). Was it necessary to move it to its new location? Perhaps this move was much needed or overdue. Who knows? Regardless, these fees seem to be too high despite the nice new location and the beautiful design. I have joked in the past writing that the Great Wall of China would have costed less. I am obviously not an expert of wall building but I cannot help not to wonder whether this amount of money spent over the summer could have been used to prevent a tax increase today? In addition, I cannot help not to think of the Lordon report, which costed us $47,000. If we try to guess the total legal fees spent by our Town, perhaps the final amount of expenses would climb between $100,000 and $200,000. Mind you, I say this without being an expert of legal costs (I just happen to be living with a lawyer under the same roof, or if you prefer, we pay the same property taxes :)). All this being said, I hope that 2018 would be a good forthcoming year where Town Council will show more financial wisdom and ethics whilst continuing to offer its great services (e.g, fast snow removal, etc.). Sometimes, in life as in politics, a simple act of free-of-charge diplomatic or social initiative, such as inviting all the people involved in an issue to sit together to chat to find a solution, can serve to concurrently manage big egos and small budgets.